Many people think of Hubble as a telescope that primarily takes striking high-resolution images; and most astronomers think of the CANDELS project as a deep imaging survey. However, Hubble also has a strong capability for spectroscopy, dispersing the light from astronomical objects as a function of wavelength to measure features in the spectrum, and the CANDELS survey itself also has a spectroscopic component. Hubble's main spectroscopic capability is at ultraviolet (UV) wavelengths, unique because ground based telescopes cannot see UV, as it is blocked by the atmosphere. But CANDELS spectroscopy, like the backbone of our imaging, is in the near-infrared, and that's what this post is about. CANDELS imaging covers contiguous areas that are relatively large for HST, tiling many fields together, but the spectroscopy is in smaller fields, one at a time. Why? The primary goal of the spectroscopic program is to follow up high redshift supernovae, an effort led by Adam Riess and Steve Rodney. CANDELS discovers supernovae by comparing images taken about two months apart, looking for the appearance of new point sources, caused by exploding stars in distant galaxies. Some of these sources are at high redshift, and some have colors consistent with Type Ia supernovae, caused by the explosion of an overloaded, collapsing white dwarf. These are very useful as a measure of distance, one of the cornerstones of the evidence for the accelerating universe and dark energy. But the supernovae and their host galaxies are very faint and difficult to follow up with ground based spectroscopy. We take grism spectra to attempt to measure the redshifts of the host galaxies, and to get spectra of the supernova, where in the best cases we can measure spectral features to determine if they are really Type Ia, exploding white dwarfs, rather than exploding massive stars. 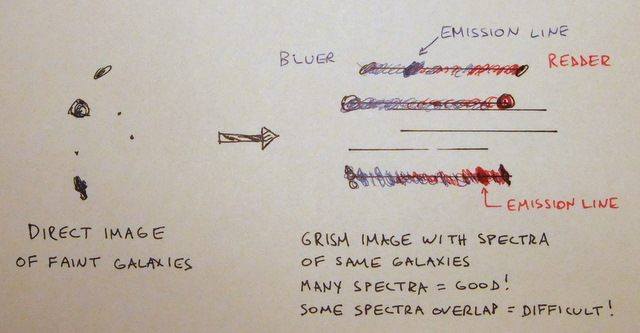 As a side result, we get spectra with the grism for most other galaxies in the Hubble field of view, and that is scientifically very useful in its own right. (Although CANDELS spectroscopy follows up supernovae one pointing at a time with relatively long exposures, there are separate Hubble grism programs that cover most of the CANDELS fields with shorter exposures, one led by me - AGHAST, and one led by Pieter van Dokkum at Yale University - 3D-HST). 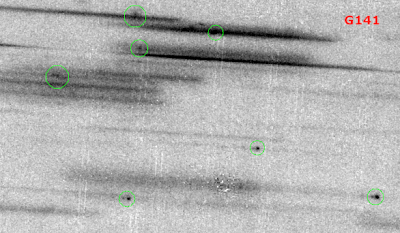 What is a grism, anyway, and how do we get spectra for a few hundred objects at a time? "Grism" is a word used mostly by astronomers, and it simply means a combination of a diffraction grating and a prism. Both are used to disperse light, bending it as a function of wavelength, like a prism you may have used to project sunlight into a rainbow on the wall. The grism is inserted into Hubble's Wide Field Camera 3 (WFC3) - Infrared instrument, where ordinarily a filter would go to make images in a broad range of infrared wavelengths. The grating is a series of parallel ridges deposited on the glass surface of the prism; the grating disperses the light at an angle that spreads out the wavelengths, and the prism bends that bundle of rays back so it goes straight into the rest of the camera, making an image on the detector. The image of a galaxy through a normal filter looks like a galaxy, but the image made through the grism is a spread-out spectrum, just like that rainbow on your wall is a spread-out spectrum of the Sun. Because the grism is in the light path just like a filter, the image made with a Hubble WFC3 grism has a dispersed spectrum for everything in the field of view. That's both a strength and a weakness. It means that one exposure gets spectra for many objects, but also that the spectra sometimes overlap, and that the light of the night sky also falls on all of the detector. This is why the infrared grisms on Hubble are uniquely efficient. From the ground, the atmosphere emits bright infrared radiation that would clobber any signal from galaxies and stars, and we have to get around this by using entrance slits in spectrographs to block most of the skylight. In orbit, the infrared background that Hubble sees is much lower (it's mostly from the zodiacal dust cloud), which allows Hubble to do "slitless" grism observations, getting spectra for many objects at once without the complexity of mechanically adjustable slits. The spectra of galaxies and stars are valuable for doing astrophysics, because they reveal features at discrete wavelengths, called absorption and emission lines. These are features from stars and from hot gas heated by young stars - the emission from hot gas comes out at discrete wavelengths, like the light from the gas in a neon sign. These can be used to measure a galaxy's redshift, or how far away it is, and the strengths of the lines tell us about the physical conditions in the stars and gas, from which we infer many facts about distant galaxies. In the 1860s, Gustav Kirchhoff and Robert Bunsen used absorption lines found in the spectra of the Sun (and later in other stars) to show that the Sun and stars are made of the same elements that exist on Earth; this was essentially the birth of astrophysics, and it still boggles my mind that we have only known this for 150 years. In grism data, the spectrum of a galaxy looks like a streak because the light is spread out in wavelength. An emission line shows up as a bright dot on that streak, a lot of light at a single wavelength. By identifying these lines, measuring the wavelengths and comparing to their known wavelengths at rest, we can get the galaxy's redshift. The distance then allows us to compute its true brightness. Because each grism exposure includes the spectra of many galaxies, we can get many redshifts - sometimes over a hundred - in a single HST pointing. This is great for us, although it also makes a lot of work to visually inspect all the spectra! The large numbers of redshifts also allow us to measure which galaxies are in densely or sparsely populated environments. Another strength of the WFC3-IR grism is that it gives us spectra in the near-infrared, beyond 1 micron. It's been difficult to take large numbers spectra from the ground in the infrared due to the sky brightness. The near-infrared is particularly interesting because for distant galaxies, the redshift moves their strongest emission lines from optical wavelengths into the near-IR. The WFC3-IR grism data are good for measuring emission from galaxies at redshifts 1-2, or when the universe was about a half to a quarter of its present age. We use the strength of emission lines, mostly from ionized hydrogen and oxygen, to understand the nature of galaxies at this long-ago epoch. The strength of the lines and the ratios of their intensities are a probe of the amount of star formation in a galaxy, the amount of metals that have been formed by stars and ejected back into the interstellar gas, and whether the gas is being ionized primarily by ultraviolet light from young stars, or from an active nucleus - a massive black hole. So far, CANDELS has used this data in a couple of papers that look at very young star forming galaxies with strong emission lines (see Arjen van der Wel's post), and there will be more to come. Just came across this post while looking for a good illustration of how a grism works. Love the illustrations, Ben!